There are books that one is grateful are written. There is no other way to praise them to the skies and recommend them to all and sundry. That is the magic of the written word that can never be contained in any other form. This is then extended to translations, and when it comes to that, more so from Bengali to English, no one does it better than Arunava Sinha who gave us Rabisankar Bal’s Dozakhnama and now he does another favour on the English-speaking reader by giving us “A Mirrored Life” by the same author. Earlier it was about Ghalib and Manto, and this time round it is about Rumi and Shams of Tabriz. Who in their right mind will not be captivated by this book? The theme was enough for me to get started and be swept by the power of language, emotion, and expression. The book is about Ibn-e-Battuta travelling away to find out more about Rumi’s life and along the way what he uncovers and what is left to speculation. It is but obvious, that when one speaks of Rumi you cannot help but mention Shams. This is how the story intertwines itself and though it may seem that there are two paths, there is just one that of amazement, wonder and life in full bloom. 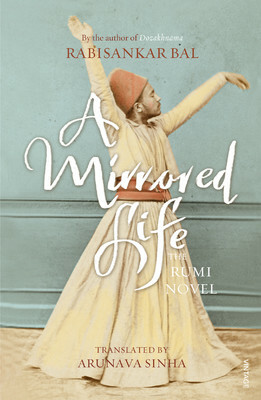 “A Mirrored Life” is about Battuta chancing upon a manuscript of Rumi’s life stories, given to him by Rumi’s disciples. He then starts reading these tales and reciting them to people he meets along the way to Konya (where Rumi was born and stayed). As he starts getting involved in these tales, he begins to make sense of the world around him and what is really important. The book is not complex. It is not an easy read either. You have to let go of all inhibitions before reading this book. “A Mirrored Life” touches on so many issues and topics without really specifying them. It gives readers the chance to interact with what the author is thinking and chooses to express through the book. The relationship between Rumi and Shams was of most importance to me as a reader. I could not help but revel in those parts and also the transition of Rumi from a Maulana to a Sufi Saint. The relationships Rumi shared with his wife, his sons and the people of Konya are beautifully described and laid out for the reader. “A Mirrored Life” makes you look at the world differently and ask difficult questions – ask them to yourself as you turn the pages and that is the tough part. This book overwhelmed me in way too many places, so much so, there were times when I had to stop reading and just contemplate on what I had read. Arunava’s translation is par excellence. I do not know Bengali, but I do know that I did not ever find the need to read the book in Bengali. The translation made no bones of wanting a glossary to be added for words that perhaps regular readers would not understand and that is the way to stay true to the essence of the original. Rabisankar Bal has just written a book which will take you by surprise and leave you wishing and hoping that it was a longer book, and somehow you don’t need a long book for this theme. It is perfect the way it is – with every word in its place and rhythm that is lilting and takes you to a deeper level. I could not stop recommending this enough on social media and I cannot stop doing the same here. A definite read for all Rumi or literature lovers out there. This entry was posted in Arunava Sinha, Authors I Love, Books, Literary Fiction, Random House India, Review, Translated Works and tagged A Mirrored Life, arunava sinha, Konya, literary fiction, Rabisankar Bal, random house india, Rumi, Shams, translation on January 27, 2015 by thehungryreader.